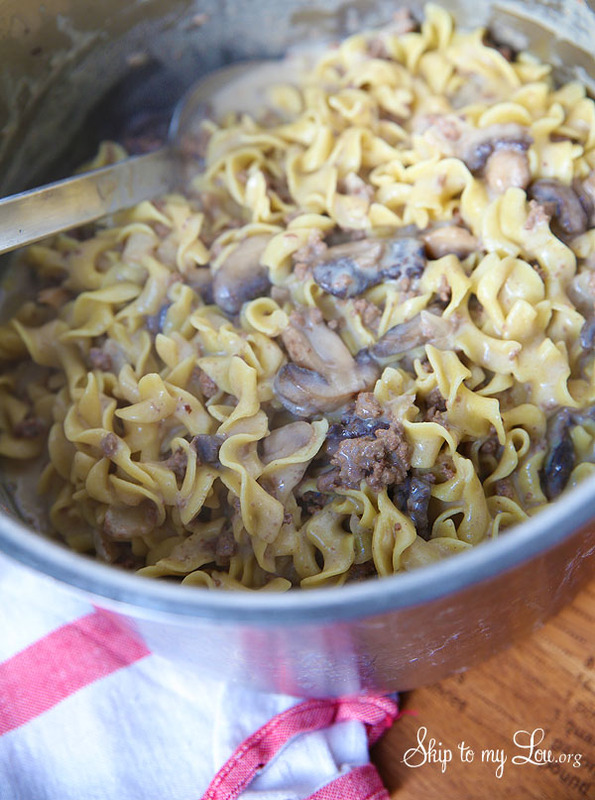 One Pot Beef Stroganoff is perfect for those busy weeknights! I love one pot meals when I am pressed for time! Our family loves one pot pizza pasta and one pot creamy chicken fettuccine alfredo. This one pot macaroni and cheese recipe is easy enough for kids to make! In large pot, cook beef,onion and garlic, stirring frequently, until brown. Do not drain. Add mushrooms and salt. Cook about 5 minutes or until browned. Add evaporated milk, 2 cans beef broth and the noodles. Noodles will not be completely covered at first. Heat to boiling over high heat. Reduce heat; simmer uncovered 7 to 8 minutes, stirring frequently, just until noodles are tender. Remove from heat; do not drain; stir in sour cream. Add salt and pepper to taste. This sounds so good and easy! We just were able to get hamburger on sale this week. I can't wait to try!